« 69 - Behaviour - what is proper? Wherever I have lived in China there have been hills of significant size visible on a clear day. Not that there are too many of those—in Xi’an the whole school (our bit) rushed to the windows one fine day when the mountains appeared to the west, just 30km away. I saw them once more that year. I went several times, it being quite a long way by bus or taxi or in a car with a temporary friend. There are relevant pictures in the essay on perceptions of safety What is safe? and in the page on Huangshan  and in the gallery. I will add a few here but will not duplicate them. path. therefore the path goes where you want to go and there is no need for any guidance. There will be few choices of route, therefore. Above, I hope you can see the lakes lying south of the local hills. The yellow pin south of Lakes C&D is where we, C&D live. The significant road is the one sweeping north of the lakes and upriver to the left and north. 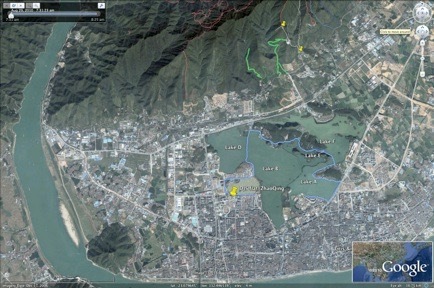 The coloured squiggles are routes as spotted using Google Earth. ed by dogs—the rare sort that bark, here. The ground falls away so steeply there is no way around the wall on the outside. The descent from the station is steep but not scrambling. At the bottom of a short descent (50m vertically?) there is a 2m high open fence just above the saddle. There is a clear trodden path off to the left which simply goes around the end of the fence, rejoining the ‘through’ path and rising maybe 30m to the ‘last’ pylon. I assume these pylons are taking power to the station. I mark the descent route in red running south from the station. 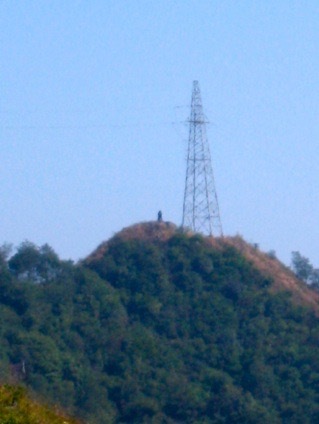 On all ascents so far I have seen people who reach the pylon. About half find the route to the station. 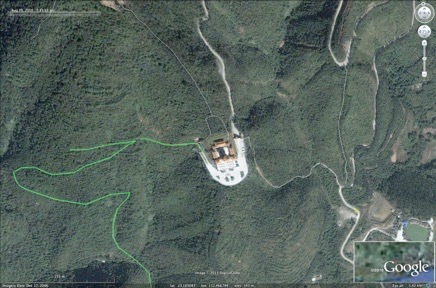 Marked in blue are two paths I can see on the satellite image but not quite see on the ground. Forget the green route for a while, please and look where the descent route ends. This is at a hairpin bend on the road to Millennium Plaza and I have drawn a white line up he small valley bed from one yellow point to the pink one. The road is a long drive and one is fleeced 20 yuan for going throught the gate at the lower yellow pin at what used to be the Zoo. Well, it still is the zoo, but it is empty of animals. It matters not whether you are on foot or bike or car, it is still charged. Most folk drive all the way. The Plaza, 23.105080, 112.466794 has a small buddhist community, a small temple tower and a range of feeding places for hungry tourists. I show here the short route found for foot traffic rom the zoo carpark (yellow pin) to the plaza carpark in white. By tracking around the flat viewing area and down the terrace to the west, past some temporary hovels and a load of cats, you can see I have added more white lines showing the ascent path on the left and a possible descent forked on the right. At the upper edge of this shot you can just see the next building, which once briefly had a statue of Guan Gong, an historic figure in these parts. C & I trudged up here on a hot day to view the statue, some 10-15m high, nearing completion. I say temporary because soon after this, it was removed explosively by the order of some disapproving official, perhaps one who was dining at leisure at the Plaza and dislike the obstruction to his evening pre-prandial walk. 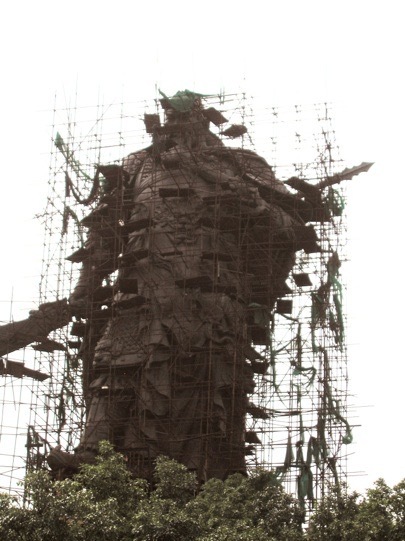 Here are shots of Guang Gong’s statue site. ... and somewhere here is a shot of the gap between the last pylon and the station itself, left, and that last pylon, with a walker beside it (from a long way off). Now for the green path. At the last hairpin of the track to the tower just before the gate that the walking group so easily walked around, there is a track dropping off the edge of the road. 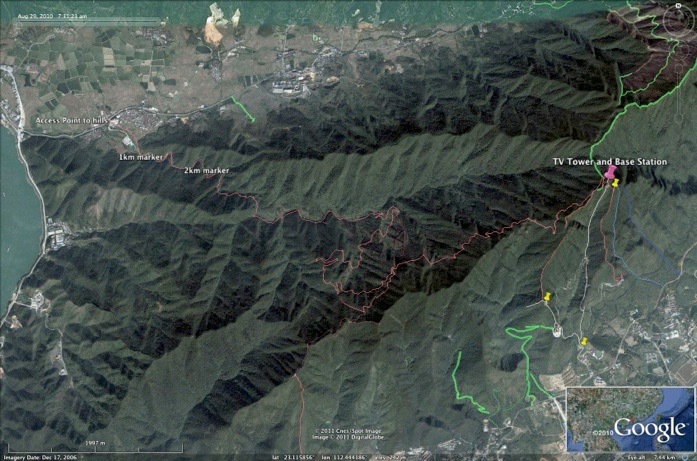 I have now found this and traversed it to the next saddle and peak, shown with these two and thanks again again to Google Earth. The hills really are this wooded. 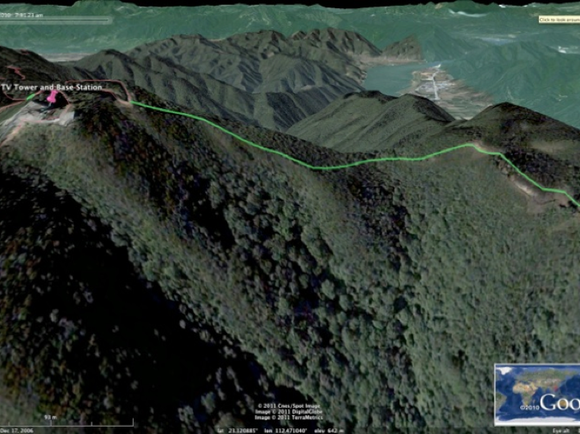 The altitude at the top shown is 708m which you can compare with the mean height of ZQ at a mere 8m. GE says the lake surface is at 3m above the river. Considering we’re at least 100km from tidal salt water, that illustrates a very flat part of the country. The oblique view above shows the upstream Pearl river (or perhaps the west pearl) in the distance. the air is rarely clear enough for good photos. Obviously, my next adventure is to explore the ridge to the north. 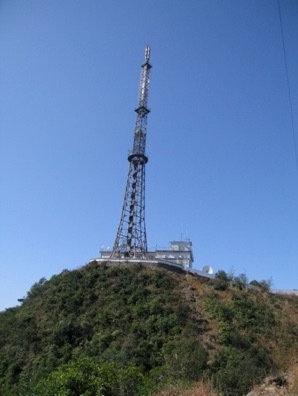 I did, once, cycle up to the foot of the red descent from the tower; I picked a hot day in the summer and spent two hours floundering around no more than 500m from the bike, failing to find the path that is so easy to follow downhill. 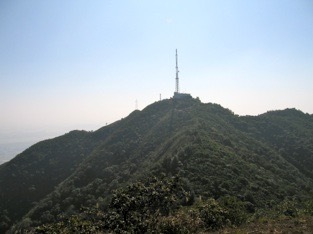 Lesson learned: ascend from the plaza, past GuangGong to the summit - two hours - then off to the north. The problem is that any descent leaves me some 25km by road from ZQ, so the smart thing to do, short of arranging an expedition and pick-up by friends or family of that expedition, is turn around and come back the same way. I’ll bet this is a slow-loading page because of the pictures. Sorry! 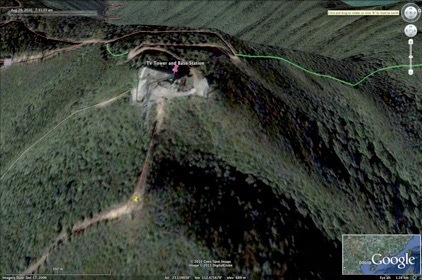 I see a peak of 920m not all that far away. Challenge!